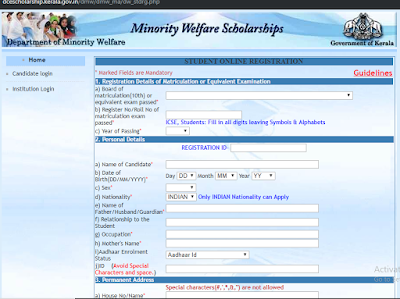 Kerala Government has invited applications from minority candidates who prepare for Civil Service Examination for financial aid under the scheme of Civil Service Fee Reimbursement (CSFR). The Civil Service aspirant should belong to anyone the religions Muslim, Christian, Sikh, Buddha, Parsis, Jains community. If they are studying in Government approved Civil Service Coaching centers, they can apply for the financial aid to cover the Tuition Fee and Hostel Fee. You can read more about the amount of financial aid and the qualifying conditions in the next paragraphs. The chart below shows the latest Fee Reimbursement offered by the Kerala Minority Welfare Department. The Scholarship amount may change every year. To apply for the Scholarship offered by the Department of Minority Welfare, you must qualify the below requirements. The Civil Service aspirant must belong to Muslim, Christian, Sikh, Buddha, Parsis, Jains community. Candidates family annual income should not exceed 8 Lakhs. If the family income is above 8 Lakhs per year, he/she cannot apply for the Civil Service Fee Reimbursement Program. The candidate should be a native of Kerala. The candidate should study in Government approved Civil Service Coaching Institutions. Those who satisfy the above four conditions are eligible to apply for the Scholarship scheme implemented by the Government of Kerala to pursue their Civil Service exam preparation. To apply for the Civil Service Exam Coaching Scholarship provided by the Kerala Minority Welfare Department, visit the link below. You must click on the link Civil Service Fee Reimbursement (CSFR) under the types of scholarships title. You should click on the button Apply Online to start filling the application form. To read the full instructions including the last date to apply in the Malayalam language, visit the link below. 80% of Scholarship is reserved for Muslim candidates. 20% of the remaining Scholarships will be distributed among all other minority candidates. You must produce the following documents to claim the minority scholarship. Copy of SSLC, Higher Secondary, and Degree exam certificates. Hi Ajay K Sharma Hello my name is Amandeep and I am a resident of Uttar Pradesh and I want a little help from you and it has helped me put my web page on my website http: //www.josforup com / and in return, I will write a complete article on your website. In most of the article, I write this method which liked young people. I can see your website is live already.